Amazon.com description: Product Description: Over 100,000 copies sold! Sales expert Mack Hanan has shown tens of thousands of salespeople how to boost their profits by repositioning themselves as consultants out to help their clients' businesses grow. Consultative Selling (TM) gives readers the tools to partner with customers rather than just vending to purchasers, maintaining high customer satisfaction, even while under pressure to make quota each quarter. 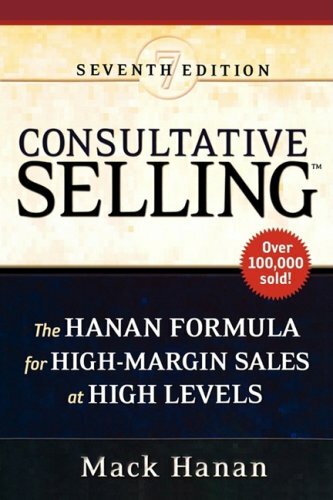 Providing a highly specific and consistently successful approach to sales, this revised edition is packed with new, more advanced strategies and techniques for applying consultative selling, including: * outsourcing * Internet sales * gainsharing as an alternative to price * value-added reselling * cost-control purchasing * and more The book still includes the same great features that have made it a steady seller for over two decades -- from a step-by-step implementation guide to case histories of methods and results in multiple industries. Packed with strategic sales tools, Consultative Selling(TM) is still a one-of-a-kind way for sales pros to maximize profits while helping their customers take their businesses to new levels." About: The ground rules for selling high ticket items are changing.